﻿ How Digital World Is Making The Shopping For Rakhi Thali Easy? How Digital World Is Making The Shopping For Rakhi Thalis Easy & Convenient? BoonToon July 14, 2015 February 18, 2019 No Comments on How Digital World Is Making The Shopping For Rakhi Thalis Easy & Convenient? This is one of those days when you do not want to fight with your sister, rather feel protective and hug her tight to assure that nothing can go wrong in her life when her brother is there with her. As for the sister, her only wish is to tie that beautiful piece of rakhi on her brother’s wrist to ensure that his sister is there to take care of him and pray for his well-being. Rakhi is a day of celebration and loud cheers amongst the brothers and sisters and the time to enjoy the truthfulness in this relationship. Although Rakhi is celebrated every year, not all of us are lucky enough to celebrate this auspicious day with our brothers or sisters. We miss out on the various rituals on offering our prayers to the Almighty praying for the safety, protection and well-being of the sibling, doing the Pooja, tying the Rakhi and finally, seeking blessings and love from each other. If we consider this situation taking place a few years back, it would have made us feel bad but not anymore. With the boom in the digital and web world in India, rakhi is celebrated irrespective of location with equal pride and happiness. 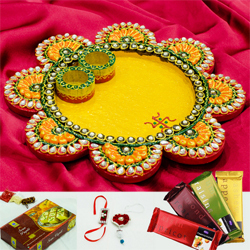 There are websites that sells Rakhi Pooja thali to its online customers and gets them delivered at the designated place on or before the day of Rakhi. These Pooja thalis contain one designer rakhi, a coconut, and two containers for Roli-Chawal. The entire thali usually has a red base with the net cloth covering it. These thalis look extremely attractive as these are available in different designs beautifully designed with stones and American diamonds, and colourful threads, some are even handcrafted made of marble, german silver, kundan etc.. The designer rakhi is usually hand crafted with different types of colourful threads, beads, stones and American diamonds and are available in the shapes of Ganesha, flowers, the first letter of the name of a person, etc. These rakhis can be customised according to the requirement of the customer at certain websites which offer such services months prior to the day. 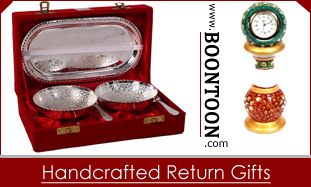 Many of the gifting websites also offer special offers where the entire set of Pooja thali along with the gifts can be designed and customised as per their choice. In India, dry fruits is one of the most traditional and common gifts that are given on such occasions, considering the fact that they are healthy gift options and can be incorporated as part of the exquisite gift hamper. 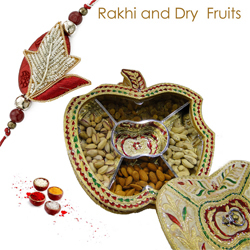 The rakhi dry fruits are available that can be gifted alongside the Dry Fruit Box. The online rakhi gift hamper retailers need to be informed prior about the choice of dry fruit box, depending on the size and amount of dry fruits. The custom of rakhi thali online shopping is gradually becoming a trend in the country and many people are opting for such options so that they do not lose out on the opportunity to celebrate Rakhi. There are many website which even cater to the customers living abroad and make sure that the rakhi thalis are delivered with the scheduled date and time.